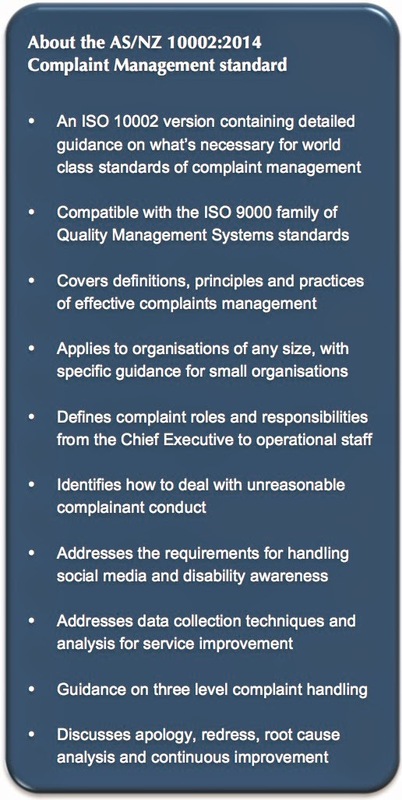 The customer service experience: Raising the standard for complaints - what's new in ISO 10002:2014? Effective, high quality performance standards define what customers can expect; how employees are expected to behave and what needs to be done when service failures prevent those standards from being reached. When things don’t quite go to plan, customers feel the pain of broken processes and those situations need to be rectified quickly and efficiently. A customer centric organisation needs to do more than just resolve the immediate issue, by learning from the problem and preventing it happening again. It’s vital that customers can effectively communicate their dissatisfaction and for decisive, corrective action to follow swiftly. If you’re in the business of serving customers and managing their complaints when things go wrong, then it’s the ISO 10002 international standard that sets out the benchmarks you should measure your organisation’s performance against. ISO 10002 changed in 2014 – how does the new version help me? It’s important to set some context first by looking at how global complaints practice has developed and the implications of this on the most recent 2014 revisions to ISO 10002. In the last twenty years or so, it can be argued strongly that the Australasian region has played a leading role in the development of complaints management practices. Academic research into topics such as unreasonable and persistent complainant behaviour  has been combined with the front-line experience of organisations like the New South Wales Ombudsman to develop guidance for complaint professionals. The resulting practice manuals  and publications   have included some exceptional advice, with many recommendations being adopted by other organisations the world over. As with many ISO standards, the earlier 2004-6 releases stated much about what an organisation needed to do, but did not prescribe the methods of how this should be achieved. The Australia and New Zealand 10002:2014 revision builds much of the region’s practical experience and published guidance into the text of the standard itself, including an extended set of appendices offering detailed advice. Whilst the general themes are adopted by the centrally published ISO version (July 2014), there remains a substantially advantageous – and very different - structure to the AS/NZ version of 10002 published in October 2014. This structure reflects greater depth and detail, particularly in the roles and responsibilities an organisation should have in place for complaint management. It’s significant for customer service managers to understand this difference, regardless of where your organisation is located in the world. When setting world-class standards, we should look to the best as our measure – and in this case, that is AS/NZ 10002:2014. When you sit down with a nice cup of coffee to read the International Standard for Complaints Management, you’ll find much greater value in the practical advice offered by the AS/NZ 10002 (October 2014) publication (available from Standards Australia). Of course, finishing your cup of coffee is just the start point. Now you need to put together a plan of action to take your organisation from its current performance to the world-class requirements you’ll have just read about in AS/NZ10002:2014. 1: Remember it’s an exercise in business change. The key lessons of successfully implementing service improvement apply, as they would to any other change programme or project. You must understand the attitude all those involved with customer service in your organisation have towards complaints. They create your customers’ service experience through their day-to-day activities so if these people aren’t with you, then any change programme runs a higher risk of failing to deliver its benefits. Improving service requires people to change their behaviour. It’s critical to establish your current strengths and weaknesses in complaints, so you can be confident you’re improving in the right areas. Undertaking a Complaints Management Assessment will help you to understand where you need to make performance improvement changes most urgently, and which aspects of the 10002 standard are most relevant for you to look at. There’s a lot of scope to make improvements with so much ground covered by AS/NZ 10002:2014. It’s important you don’t try to solve every problem at once, but focus your attention on the most significant issues first. Use the results you achieve to build momentum and support amongst your people for further changes, as part of a managed delivery plan. If you’ve made it to the end of AS/NZ 10002:2014, you’ll see section 9 is all about continuous improvement. This means the changes you make shouldn’t be ‘one hit wonders’, but the first step on your journey to put complaints at the heart of customer service and continuous improvement. If you’d like to know more about using the AS/NZ 10002:2014 standard to improve your customer experience and complaints performance, register for our next Complaints Improvement Workshop. Lester, G. et al., 2004. Unusually persistent complainants. The British Journal of Psychiatry, 184(4), pp.352–356. Ombudsman New South Wales, 2012. Managing unreasonable complainant conduct, http://bit.ly/nsw_ucc_manual_pdf. Better Practice Guidelines on Complaints Management for Health Care Services. Australian Council for Safety and Quality in Health Care, 2004, pp.1–20. McMillan, J., 2007. Thirty Years of Complaint Handling – What have we learnt? 30th Anniversary Seminar of the Commonwealth Ombudsman, pp.1–6.